Week in Review: Some charter schools are welcoming special-needs students. It’s expensive. Noble Minds founder Vera Triplett holds a potential future student while chatting with current students Joelia Simmons and Langston Kali. This week featured a look at New Orleans charter schools that have developed reputations for accommodating kids with special needs. It was produced in partnership with The Hechinger Report, a nonprofit, independent news organization focused on inequality and innovation in education. Although all schools must accept students with disabilities, a few New Orleans charter schools, including Noble Minds Institute for Whole Child Learning, Cypress Academy and Morris Jeff Community School, have placed special emphasis on the inclusion of all children. Larger charter networks such as Collegiate Academies and New Orleans College Prep have also expanded their focus beyond college-or-bust, investing in intensive programs to help students with intellectual and other significant disabilities prepare for life as independent adults. But the challenges of serving a higher-than-average population of children with disabilities can be daunting. A single, small charter school doesn’t have the economies of scale that can make it easier to afford specialists like speech pathologists or sign language interpreters. The first few years after a charter opens, before it has a full student population, are particularly precarious. Cypress Academy learned that the hard way. 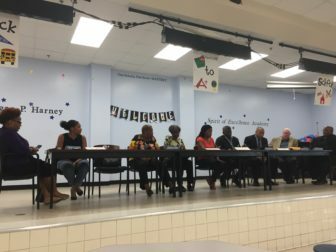 In just three years, its special education population ballooned to 26 percent of the student body, according to a letter from parents to the Orleans Parish School Board. The school projected that it would need an additional $600,000 to stay open for another year. In May, the Cypress board of directors sought to merge with another charter, Lafayette Academy. 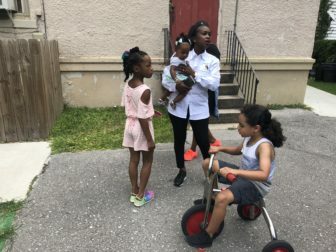 Instead, after parent outcry, the Orleans Parish School Board, which authorizes most charters in the city, announced it would take over management of the school for the next two years. The city’s Real Time Crime Monitoring Center. The City Council Budget, Audit, and Board of Review Committee unanimously voted to appropriate $100,000 to the New Orleans Office of Homeland Security for the installation of eight new crime cameras in Gentilly. The cameras would feed into the city’s Real Time Crime Monitoring Center, the city’s surveillance hub. The proposal is part of the “Gentilly Development District crime camera plan” and was considered at the request of Mayor Latoya Cantrell. It will now advance to the full City Council for a final vote. Earlier this year, Cantrell said she wouldn’t revive Mayor Mitch Landrieu’s abandoned plan to force bars and restaurants to install city-linked cameras. But she has shown a desire to grow the camera network in other ways. In May, Cantrell supported a non-profit camera network’s plan to add 300 street facing cameras to their system and encouraged others to do the same. Her administration’s “first quarter check-ins” — released this month to mark Cantrell’s first three months in office — included a section on plans to integrate privately owned security cameras into the network. 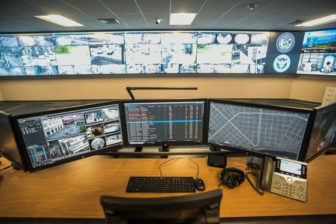 “The ‘canopy’ of cameras integrated into the Real Time Crime Center is virtually unlimited as we utilize private sector cameras to supplement the city-owned cameras,” the report said. The August 31 meeting of the Harney charter school board. The school has struggled to comply with school district requirements and has received 10 district warning letters in the past year. Orleans Parish school district employees Kellie Peterson and Erica Murray sat quietly at student lunch tables earlier this month, observing the board meeting of a Central City charter school facing an array of governance and financial problems. Edgar P. Harney Spirit of Excellence Academy has received at least 10 warning letters from the district in the past year – for sloppy financial management, failing to provide adequate special education services and improperly holding onto employee retirement contributions, which the district said may violate federal law. The board had also fallen to five members, two below the district’s required minimum for charter school boards. Murray and Peterson’s boss told The Lens they were at the meeting to monitor board compliance. The board elected two new members that night. The duo is part of a new team in the district’s Office of Equity and Accountability which will conduct ongoing oversight in academic performance, financial sustainability and operational effectiveness. A wave of central office activity is making it increasingly clear that charter board governance is a priority of the newly unified school district. But some charter advocates worry that increased board scrutiny may threaten charter schools’ autonomy, which is a central part of the New Orleans education model. 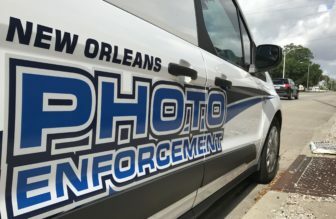 On the campaign trail, one of Mayor LaToya Cantrell’s most consistent campaign promises was that she would revisit the city’s traffic camera program, which was significantly expanded under her predecessor, Mayor Mitch Landrieu. Cantrell called for scrapping the program altogether, or at least suspending it pending the completion of a comprehensive safety study. But since taking office, her administration has yet to come out with a firm policy proposal for the program. And with city budget season fast approaching, it hasn’t addressed how it would deal with the lost municipal revenue. The cameras are expected to produce between $25 million and $30 million this year, about 25 percent of which goes to the city’s camera contractor. On Thursday, the City Council’s Budget, Audit, and Board of Review committee expected to get an update on the mayor’s plans for the future of the city’s traffic cameras. That’s not what they got. Opinion: Sure, nutria are wrecking our coast — but what about the devastation by two-legged mammals? “Nutria didn’t get here on their own. They were brought from South America to Louisiana in the 1930s as a new source of pelts for the garment trade. Whatever nurtria thought about being turned into fur coats and hats, they loved the river deltas and the abundance of aquatic plant stems that are their dietary mainstay. As the numbers of nutria grew, they ate their way through the wetlands. And as the vegetation started to disappear, so did the sodden land the plants had held in place.